MAGIC GIFTS will appear as a bonus in the back of GUNMETAL MAGIC, Andrea’s book. Magic Gifts is a novella included at the back of Andrea's book Gunmetal Magic. This story stars Kate and Curran and the timeline coincides with the first half of Gunmetal Magic but I would actually recommend reading the novella before the full length book. 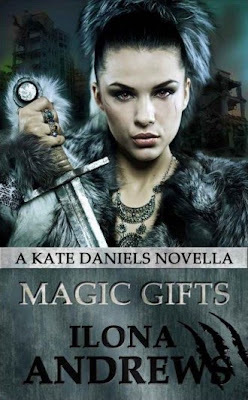 Anyone who has read any of my previous reviews will know how much I adore Kate and Curran so of course I jump at the chance of reading any story containing them and Magic Gifts was a fabulous one. Things never seem to go smoothly for our favourite couple, they hardly ever get any peace and quite to spend time together so it won't surprise you to hear that their latest attempt at a date is no exception. Before they've even had a chance to start eating one of the People is dead and vampires are running amok. They work together to get things under control but the next thing they know a seven year old boy is wearing the magical necklace that just killed his sister and is now slowly taking his life too. Kate and Curran can't allow a child to die but they're going to have to battle their worst enemy yet to find a way to help him. This novella has everything I love about the series, the fabulous relationship between Kate and Curran, witty banter, great side characters, a fast paced and well thought out plot and some fantastic fight scenes. Fans of the series are going to love this one!